Business entrepreneur – with extensive experience in all aspects of the marine industry, and considerable general management consulting experience in a variety of other industries, Founder/owner of a marine products company supplying all major boat building companies with innovative products, designed and sold hundreds of new boats and pre-owned yachts , involved in numerous projects in the motion picture and television industry, event organizer/creator of major marine events including: the 100 the anniversary of Statue of Liberty Celebration, the Miami Superyacht Show, power boat poker runs etc., Consultant/partner to the Seminole Tribe of Florida on windmill farms and exportation of agricultural products to Cuba, developer of a variety of other businesses, and highly experienced yachtsman. General yachting experience – With more than 30+ years’ experience as a professional in the Marine Industry and prior personal experience with the US Coast Guard, Mr. Berton has personally been involved in the design manufacture and sale of a significant number and wide range and style of yachts up to 200 +feet in length. As a consequence he is intimately familiar with contracts and negotiations involving new construction, whether foreign or domestic and the most effective methods to evaluate and acquire or sell a yacht. He is highly experienced on the water with extensive day and night navigation, of both USA Coasts, from Key West to Nova Scotia and Long Beach to San Francisco, the entire Gulf Coast, the Bahama Islands, The Mediterranean Sea including most of its islands, Mexico and Asia. Mr. Berton holds a 100 ton Captain’s license, a Florida Yacht Broker’s License, is a trained meteorologist; retired editor of Motor Boating Magazine, Former US Coast Guardsman; Member of the Explorers Club; and consultant to the motion picture industry, celebrities, and captains of industry. He also holds several offshore powerboat records. Marina experience – Mr. Berton is knowledgeable in all aspects of marina operation and has more than ten years’ experience as the chief executive officer of a seven facility multi-marina group providing full services to more than 3,500 customers. These marinas were private, City and Federal properties and required significant interaction with all government agencies as well as retail consumers for the development, expansion and operation of the properties. Click HERE to view Mr. Berton’s professional licenses and associations. 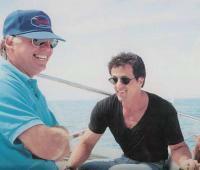 Boat development and sales – Mr. Berton has developed a number of boats including with F.A.O. Porsche -the Porsche design boat, the Cigarette 38, the Sealine 47 (winner of the Boat of the Year 2000), and a variety of domestically produced boats and yachts from 30 to 85 feet. Additionally, he has imported and marketed new and pre-owned boats from England, Italy, France, Austria, Thailand, and Australia. These activities included contract negotiations, currency considerations and hedging, shipping, insurance and customs handling. Mr. Berton’s clients have included many captains of industry, Celebrities, business professionals, corporations and private citizens from all walks of life both from the USA and abroad. 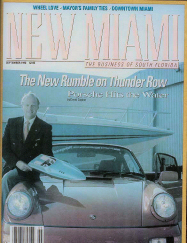 He has also formulated numerous successful marketing and branding campaigns, including winner of the best display in the Miami Boat Show (twice). He has traveled the world markets extensively, both in the worldwide sale of yachts, and in visiting a number of shipyards, and consequently is quite familiar with construction techniques, and many of the worlds harbors and cruising grounds. Mr. Berton has also worked on the development of a variety of hi performance propulsion systems and is intimately familiar with surface drive applications and various propeller technologies. Movies and TV – Mr. Berton has been a member of SAG the Screen Actors Guild and Stuntman Association of Motion pictures, and among his credits/involvements are “The Protector” (Jackie Chan), The Specialist, (Sylvester Stallone, Sharon Stone), Strip Tease (Demi Moore), Miami Vice (Jamie Fox, Colin Ferrell), Into the Blue (Paul Walker, Jessica Alba), Too Fast Too Furious (Paul Walker, Tyrese Gibson), Wild Things ( Matt Dillon, Kevin Bacon, Naomi Campbell, Denise Richards), TV series South Beach, Bacardi Mojito, Rolex commercials and the MTV awards plus much more. for the event involving Liberty Island and Ellis Island and a host of dignitaries including the presidential party, many celebrities, political figures etc. Mr. Berton along with Mr. Janssen of Motorboating, created the concept and staged “rally to the race” which evolved into the Poker Run. He also completely organized and conducted the only ever International Offshore Boat Race week event which took place around Manhattan Island and was viewed by more than two million spectators and was the first and was sponsored by Chrysler Corporation. Mr. Berton also organized other marine sporting events including a Hudson River powerboat race for the benefit the NYC Police department. Mr. Berton also created and developed the annual Miami Superyacht Show for yachts 140 to 500 feet in conjunction with Show Management and Watson Island which featured 25 yachts in its first event Feb 2016. Consulting/Companies – Mr. Berton has been involved in a wide variety of management consulting activities ranging from organizational structures. corporate feasibility, developments etc. Projects included feasibility analysis of the cruise ship industry in Palau and Saipan, marine manufacturing companies, boat sales companies, marinas, expert witness, windmill farms, investor properties, financial company reorganization and consulting + much more. Mr. Berton’s companies currently have affiliations with Italian, Spanish, German, Norwegian, Turkish, Chinese, and USA companies among others in various entrepreneurial enterprises ranging from products to food to consulting.